- Access to the MIPIM database: with the London Club you are registered like an exhibitor. As you will be listed under the London Stand everyone on the database will be able locate you. - Complimentary beverages: you can get free refreshments all day for yourself and guests. No admin or expense receipts when you get home, it's already been paid for. - Use the London Stand as a base: we have members only meeting areas that you can use to host client meetings. This is a great time saver and streamlines your networking so you can fit in more meetings and take advantage of the high quality of delegates on the London Stand. - Personalised support: We can help and advise on everything from publicising you on our instagram, twitter or completing your registration process. 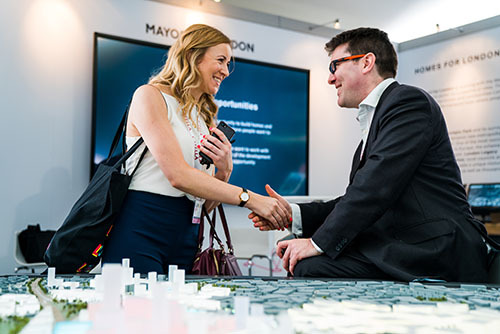 - Company name mentioned on London at MIPIM website with a link to your homepage or MIPIM page. *If registering with an international or non-London/home counties address, a full rate of £2,400 + VAT applies per delegate after 25th February 2019. *If registering with an international or non-London/home counties address, a full rate of £2,290 + VAT applies per delegate until 25th February 2019. In accordance with Reed MIDEM’s regulations, the London Stand operates a strict no refund policy on all delegate passes once the digital contract has been accepted. If you are no longer able to make the event you are free to transfer your pass to another colleague, this is free up until 22nd January 2019 after which an admin charge of £200+VAT will apply until 25th February 2019. After this date, a full new pass must be purchased at the onsite rate for any name changes.